CharityComms, like most charities, is governed by the people we benefit – people like you. We’re looking for comms professionals to join our board and make an active contribution to governance and the development of our vibrant organisation. We’re looking to appoint two elected trustees and one co-opted trustee. We’re after enthusiastic, inspiring communicators who can help to make sure CharityComms meets its goals and continues to offer services and member benefits which enhance the professional and personal development of charity communications professionals. This is a fantastic opportunity to help shape the strategy and impact of your membership body, share your ideas and experience, work alongside highly regarded peers and gain valuable experience in governance. Who can stand to be an elected trustee? Candidates must be either an individual member, organisational member or corporate partner of CharityComms. Candidates will be voted onto the board by CharityComms members. Individuals with experience of working in a communications agency with commercial and charity clients. In line with CharityComms constitution, the board can co-opt up to six trustees. Trustees have decided to co-opt a trustee with finance expertise. Please do consider nominating a colleague in your organisation with relevant expertise. The deadline for applications for a co-opted trustee is 14 August and will be followed by selection interviews in early September. 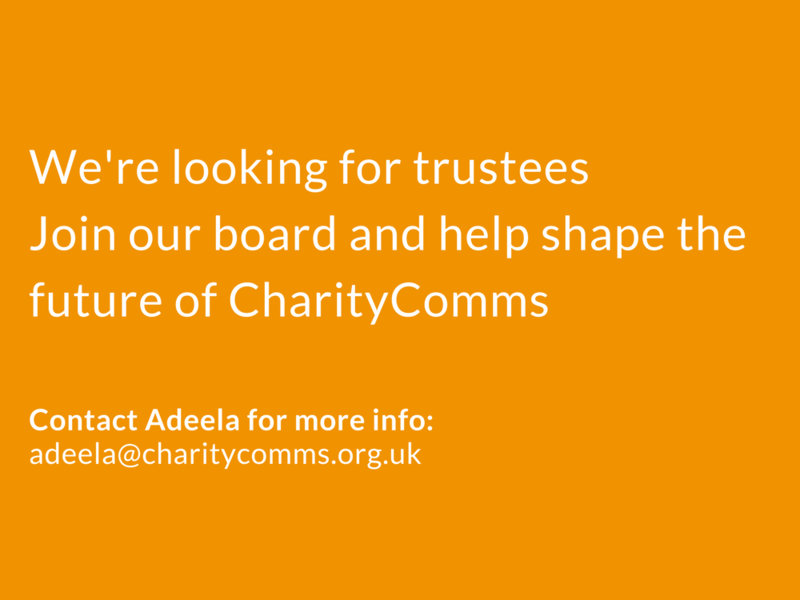 What’s involved in being a CharityComms trustee? Our trustees meet four times a year for board meetings at a venue in central London. These meetings take place on a weekday, usually between 6 and 8pm. You’ll be expected to attend these meetings, to prepare for them by reading board papers prior to the meeting and to contribute to the discussions during the meeting. You will also be expected to attend our annual AGM, usually held in London in September. We’ll invite you to various CharityComms events, such as our conferences or member lunches, which are optional to attend, but we strongly encourage trustees to attend as many as they can. You may be asked to contribute your thoughts and advice on various topics between meetings, usually via email or telephone (for example to support product/service development initiatives), and occasionally to engage in ad-hoc task and finish groups on governance and strategy matters. What does the election involve and how to stand? It’s easy to apply: just tell us why you think you’d be a great CharityComms trustee. We’ll post applications on our website and ask our members to vote for their preferred candidates. No hustings or speeches required! If you’d like to put yourself forward for election, please email our CEO Adeela Warley on adeela@charitycomms.org.uk with details listed below. This will be circulated to the full CharityComms membership during July/August to enable them to vote. The deadline to stand for election is 5pm on Friday 14 July 2017. Online elections will take place between 24 July – 18 August with the elected candidates publicly announced early September and invited to our next board meeting on Monday 18 September. Got questions about the elections? We hope our Q&A about the trustee elections will answer them. Please send your application with a copy of your CV to Adeela Warley adeela@charitycomms.org.uk no later than 5pm on Friday 14 July. Please send your application with a copy of your CV to Adeela Warley adeela@charitycomms.org.uk no later than 5pm on Friday 14 August.